Hindustan Aeronautics Limited (HAL), a Navratna Central Public Sector Undertaking, is a premier Aeronautical Industry of South East Asia, with 20 Production/ Overhaul/ Service Divisions and 10 co-located R&D Centers spread across the Country. HAL’s spectrum of expertise encompasses design, development, manufacture, repair, overhaul and upgrade of Aircrafts, Helicopters, Aero-engines, Industrial & Marine Gas Turbines, Accessories, Avionics & Systems and structural components for Satellites & Launch Vehicles. Applications are invited from eligible candidates, in the prescribed proforma fulfilling the requirement, for various posts at Hindustan Aeronautics Limited, Koraput Division in Sunabeda. Eligibility Criteria for HAL Koraput Recruitment 2015 is given below for various posts. Candidates can check full eligibility criteria clearly before applying. Qualification requirement: MBBS + PG Degree/PG Diploma in General Medicine. Qualification should be recognized by Medical Council of India. They should have registered with any state Medical Council under Medical Council of India Act. Experience requirement: Candidates applying with MBBS + PG Diploma should have at least one year experience in the concerned speciality i.e. Medicine, after obtaining the Post-Graduate Diploma. If the candidate claims post-qualification experience in PSUs/Govt/Semi-Govt, it should be in the next below Grade or in equivalent post. Candidates possessing MBBS + PG Degree in the concerned speciality may apply even without experience. Qualification requirement: MBBS + PG Degree/PG Diploma in Obstetrics & Gynecology. Qualification should be recognized by Medical Council of India. They should have registered with any state Medical Council under Medical Council of India Act. Experience requirement: Candidates applying with MBBS + PG Diploma should have at least one year experience in the concerned speciality i.e. Obstetrics & Gynecology, after obtaining the Post-Graduate Diploma. If the candidate claims post-qualification experience in PSUs/Govt/Semi-Govt, it should be in the next below Grade or in equivalent post. Candidates possessing MBBS + PG Degree in the concerned speciality may apply even without experience. Qualification requirement: MBBS + PG Degree/PG Diploma in Paediatrics. Qualification should be recognized by Medical Council of India. They should have registered with any state Medical Council under Medical Council of India Act. Experience requirement: Candidates applying with MBBS + PG Diploma should have at least one year experience in the concerned speciality i.e. Paediatrics, after obtaining the Post-Graduate Diploma. If the candidate claims post-qualification experience in PSUs/Govt/Semi-Govt, it should be in the next below Grade or in equivalent post. 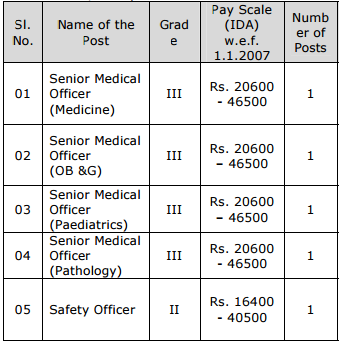 Candidates possessing MBBS + PG Degree in the concerned speciality may apply even without experience. Experience requirement: Candidates applying with MBBS + PG Diploma should have at least one year experience in the concerned speciality i.e. Pathology, after obtaining the Post-Graduate Diploma. If the candidate claims post-qualification experience in PSUs/Govt/Semi-Govt, it should be in the next below Grade or in equivalent post. Candidates possessing MBBS + PG Degree in the concerned speciality may apply even without experience. Experience requirement: Candidate should have at least Two years working experience in a factory in the relevant area i.e. Industrial Safety, after obtaining (Degree in Engineering + Diploma in Industrial Safety) or (Diploma in Industrial Safety + Degree in Engineering). Upper age limit is relaxable by 5 years for SC/ST candidates in respect of vacancies reserved for them. Upper age limit is relaxable by 10 years for Persons with Disabilities (PWDs)/Physically Handicapped (PH) persons, which will be over and above the relaxation admissible for candidates belonging to SC/ST/OBC i.e. (15 years for persons belonging to Scheduled Castes/Scheduled Tribes and 13 years for persons belonging to other Backward Classes in respect of the posts reserved for them). Candidate is required to apply by Offline mode only. Candidates can download the “Application Form” from HAL website OR from the link given below. Filled-in Application Form duly signed and affixing latest passport size colour photograph along with required demand draft and self attested true copies of the required testimonials/documents are to be sent by post/courier, to The Manager (HR), Recruitment Cell, Hindustan Aeronautics Limited, Koraput Division, Sunabeda-763002, Dist: Koraput, Odisha. The selection for the above mentioned posts for HAL Koraput Recruitment 2015 will be by way of Personal interview only. Assessment will be done by giving proper weightage to candidate’s Educational Qualification, No. of years of relevant experience, Job Knowledge, General Knowledge and Personality. Extra marks will be given for every additional stage of qualification and additional year of experience. Applications received from the candidates will be scrutinized based on the minimum eligibility criteria like essential educational qualifications, age, category, years of post qualification experience etc. Thereafter, list of eligible candidates will be prepared. Finally, candidates will be short-listed based on the number of years of relevant experience and they only will be called for interview at a prescribed ratio, as per the company rules. Documents in proof of Experience: Experience certificate should be issued on an authentic letter head by a Competent Authority. In case of serving employees, latest salary certificate /Pay Slip may be sent in place of relieving order. Registration Certificate with any state Medical Council under Medical Council of India (MCI) Act.